copyranter: It IS hard for black kids to fit in on the Upper West Side. It IS hard for black kids to fit in on the Upper West Side. It's gotta be tough on the purple girl, too. Outdoor poster—snapped in the very white, very socially-conscious UWS—for the NYU Child Study Center. 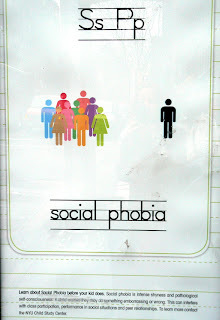 Copy reads, "Social phobia is intense shyness and pathological self-consciousness." Actually, "pathological self-consciousness" is a pretty dead-on description of the day-to-day mindset of many of the super-human, über-active UWS parents. 1. Kenneth Cole's puns are re-hyphen-tarded. 3. as pure as the driven snow. 4. TRIBECA HORROR FILM FESTIVAL. 5. Bowlmor Lanes. No Alleys (?). If that black kid would lighten up we'd all be better off. What's the point there? To force the kid into the group? Or for the group to accept the kid? Jesus PC Christ. BTW, love the new logo. It's probably an attempt to identify the next Cho Sheng whatever his name was. Poor dude. See, he was Korean and will never be remembered like Lee Harvey Oswald or John Wayne Gacy or any other red blooded intensely shy, pathologically self-conscious American sociopath. UWS parents - find the lurker who doesn't talk - AND GET HIM KICKED OUT OF YOUR CHILD'S SCHOOL. Thanks, Plato. Personally, I like to lurk myself under pseudonyms, occasionally coming out of my intensly shy shell. I love how there're zero white peeps, if you will, slash stick figures to be found. And instead your ush exemplars of hyperbolized ethnicity: the orange innocent, the discriminated purple person, et al. What assaholic realism! Bravo. Does that guy look bigger than the other guys, or is it just me? Good thing we have the fourth wall to keep us safe from all those coloreds. anon, a quick on-screen measurement reveals that the "black" kid is the same size as the others. he does look bigger though. why does the the lurking shy kid hafta be black? bastards. ny radical- "assaholic realism", very nice. i. Five years later, I'll reply: dude you're so right. Totally missed the entire background of this precisely chosen pixelated foreground. ii. Just saw your Lies Well Disguised last one or whatever. Why's it your last on Gawker? Hmm. You can just email me that answer. Or go to Paris. Or whatever. Cheers. This ad has nothing to do with race and the fact that people associate these icons with different ethnicities has more to do with them than the ad itself.